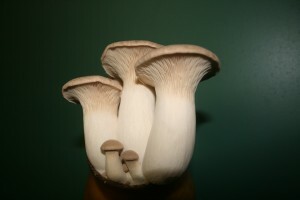 Another exotic mushroom variety called Pleurotus eryngii is a fleshy, gilled mild flavored mushroom. This variety has also been called Royal Trumpet or King Oyster. A great meat substitute is the big kahuna of all mushrooms, The “King Oyster Mushroom.” This mushroom is awesome. It’s mostly stem and no cap and is around 6 inches in length. Protein quality is nearly equal to animal derived protein. Also contained are carbohydrates, fiber, vitamins B1, B2, plus minerals, especially iron and an antioxidants. This mushroom shows protection against cancer and high cholesterol. It has shown activity in the following areas: antitumor, immune response, anti-inflammatory, antiviral and antibiotic. The Alii Oyster has a wonderful nutty flavor, a resilient firm texture, and an amazing shelf life. Chefs in some of the country’s finest restaurants have remarked on its versatility and will often use it in place of wild mushrooms. It has a great range of flavor, depending on the preparation style. It can be sauteed, grilled, braised, stewed, or broiled. Unlike many mushrooms, the stem has the same wonderful texture and flavor as the cap – nothing is wasted.. The stem may be sliced into medallions and prepared like seared scallops… Alii Oysters offers endless opportunities for creativity!